Posted on 08. Jul, 2009 by Corey in All, Dayton Dragons Baseball, General Baseball. 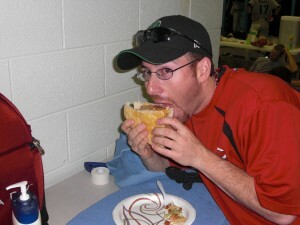 There are two things that Dayton Dragons Athletic Trainer Tyler Steele cannot say ‘no’ to, a cheeseburger, or a challenge made his way. 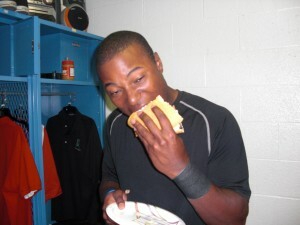 While in Grand Rapids, Michigan with the team to take on the West Michigan Whitecaps, he was presented with both a burger and a challenge at the same time. A new addition to the ballpark this season in Grand Rapids is an entrée called “The Fifth Third Burger.” The Nantucket Baking Company in Grand Rapids starts with one pound of dough and makes an 8-inch sesame seed bun to serve as the base for this burger. 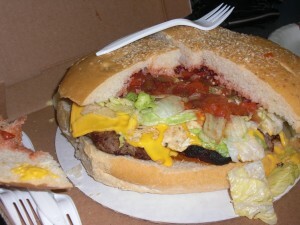 The bun is then topped with five, yes five, one-third pound hamburger patties, a cup of chili, five slices of American cheese, a mound of salsa, a few spoons full of nacho cheese and some tortilla chips. The burger is then finished off with lettuce, tomato, and sour cream. Adding your own jalapenos, ketchup or mustard is optional. 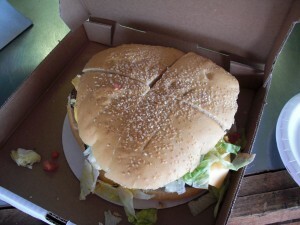 The “Fifth Third Burger” is so big that you need a pizza cutter to cut into four pieces to be eaten. This burger comes to a total of 4-pounds with all the toppings on it and costs $20 to purchase. 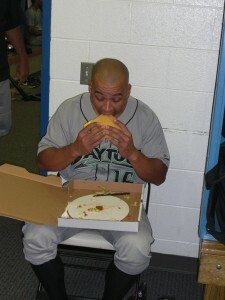 Anyone that can eat this entire burger during the length of one game gets their picture on the wall and a free T-shirt. Steele, who swears he can give world famous eater Joey Chestnut a run for his money in a burger eating contest ordered himself a burger and sat down to begin the journey. 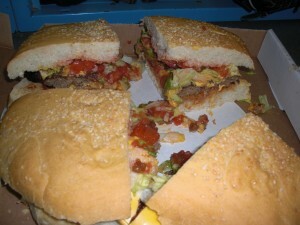 Just to make sure he went all out, Steele loaded his burger with some extra jalapenos and loads of ketchup. There are certain rules that the front office at West Michigan has come up with. 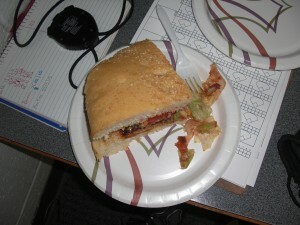 The burger is served in a pizza box, and must be eaten at a special picnic table on the concourse. A staff member dressed as a referee in the traditional black and white stripes must be on hand at all times to oversee the eating. A participant is allowed to get up and walk around to take a break from eating, but the burger box must remain in the competition area. As Steele sat down and began to demolish the first fourth of the “Fifth Third Burger,” he looked at me and said, “This is a joke. This is going to be too easy, so why don’t you go get me a side of fries also.” Obeying Steele’s request, I went back to the concession stand to order him a side of French fries with ketchup. The crowd around Steele began to build as everyone wanted a look at what was going on. I felt like I should have collected money from people as admission to watch this historic event. Rumbles in the crowd could be heard everywhere as people were talking about the “Fifth Third Burger” and how easy Steele was making this challenge look. The scariest part of this challenge is to read the nutritional facts that go along with this burger. There are 4,889 calories and 299.5 total grams of fat, adding up to 460% of what anyone should have in a given day. The cholesterol stands at 744.6 grams and there is over 10,000 mg of sodium in this burger. If you can take any good news out of the nutrition, there are 17.9 grams of fiber and a whopping 198.7 grams of protein. Let’s just say most people take two or three days to eat this total amount that Steele is consuming in one sitting. One fan watching from around the picnic bench yelled out, “I think I just consumed 100 calories smelling the burger.” The other people surrounding let out a laugh as Steele marched on passing the halfway point of the burger. Smiling, Steele looked at me and mouthed, “This is a piece of cake. Why don’t you go over and tell them my t-shirt size to get the prize ready.” I have to say I was quite impressed with the performance so far as my stomach was getting full just watching. Outside of the concession stand where the “Fifth Third Burger” is sold, are the pictures of the people who have finished the entire burger. As I was reading through them to see the names and where they were from, I could not find any women that have completed the challenge. I was told by the referee, that only one woman has tried it on opening night, but could finish it. 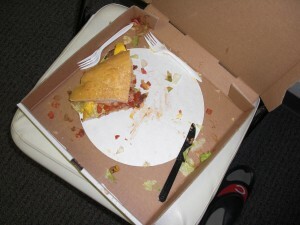 Steele has ¾ of the burger finished and began to work on the final section. He took a break every few bites to sip his Pepsi or grab a handful of fries. Running low on his drink, he sent me back to the concession stand to refill the Pepsi as he entered the home stretch. I had seen Steele eat a lot before as we went to Steak and Shake together a week earlier and he inhaled two triple steak burgers, but this was on another level. I shook my head wondering how one man can make this look so easy in such a short amount of time. Looking around the crowd was still growing larger and larger to watch Steele finish this 5/3 pounds of meat, and all the topping totaling four pounds of food. We were minutes away from completion and the roar got louder and louder as people starting cheering and chanting trying to urge Steele to finish. “Wow this is a tasty burger,” Steele said as he shoved the last few bites into his mouth. 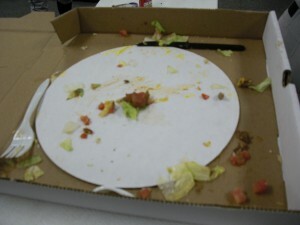 It was gone as the pizza box lay empty of the table. Steele stood on the bench arms raised in the air as he received a huge round of applause from the crowd. Steele has toppled the giant, finishing the “Fifth Third Burger.” He grabbed his box and left the competition area with a huge smile on his face. But as soon as he crossed the rope and left the picnic bench area the referee blew his whistle, and yelled “competitor is disqualified from burger eating contest and will not be awarded a prize.” Booing came over the crowd as the referee explained that Steele had broken the rules, and not finished the burger before exiting the competition area. ...one tough burger eating challenge. 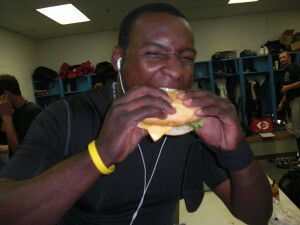 Byron Wiley eats the burger then goes out and hits 3 homers in one game!! i feel like tossing my cookies just reading this. I think they were wrong not giving him that shirt and he should of fought them. you did not eat that burger, CB. You are too soft. Maybe if you were not crushing protein bars all the time you could do it. Maybe you should go on the hollywood diet. Mackdaddy, planning on making anymore Dragons game this season?